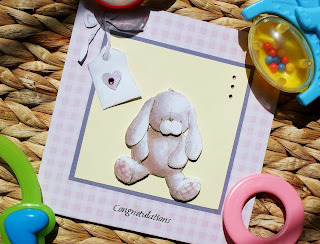 Yesterday I showed you a handmade card to be given to happy parents of a new born baby boy. 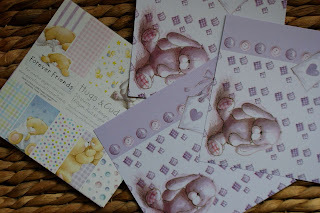 Of course I made a card for a baby girl too. And it's just as cute and easy, but pink. Find the picture of the rabbit. You will need 3 of those. From the first picture cut out the whole outline of the rabbit and the tag with the bow. From the second picture cut out an outline of the rabbit's legs, hands and head with the ears as shown in the picture above. From the third card cut out rabbit's ears, nose and mouth and feet and a heart from the tag as shown on the top right corner of the picture above. This bit is quite fiddly and it does take some time to cut it all out (I used nail scissors) but the rest is very quick and easy. Take white card 15cm x 30cm and fold it in half. Take a pink-checks card paper (size 15cm x 15cm) and using double sided tape attach it to the white card. 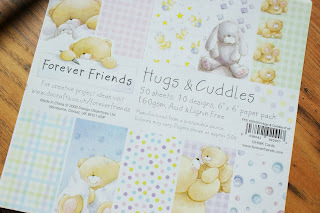 Take a pale yellow card (9 x 9 cm) and attach it to the lilac card (10 x 10 cm) using double sided tape. 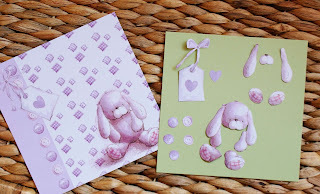 Attach the pale yellow-lilac card paper to the middle of the pink-checks card using foam pads. Now it's time to use the cut out parts of the rabbit and the tag. 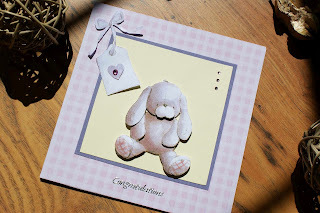 Take the cut outs from the first picture card and attach them to the pale yellow card (Attach the outline of the rabbit to the card using double sided tape and the tag using foam pads). Take the cut outs from the second picture card and attach them to the card over the pictures using foam pads. 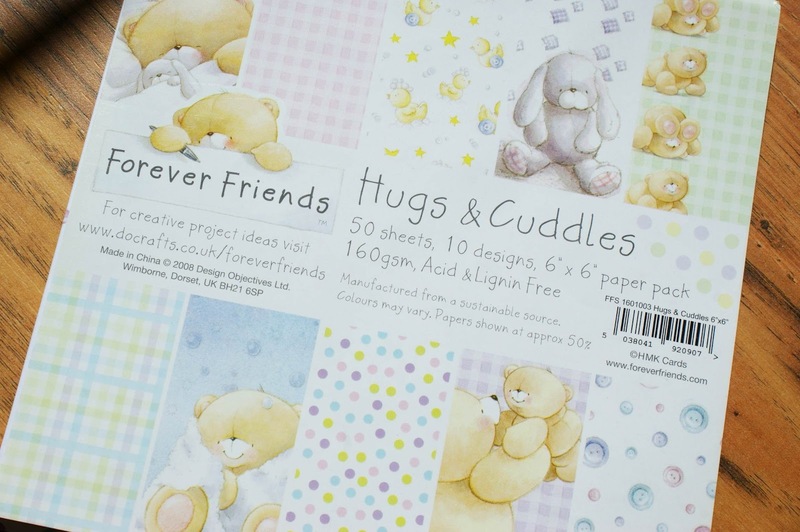 Then take the cut outs from the 3rd picture card and again attach them to the picture on the card using foam pads, creating layers. Attach a pink gem to the heart and 3 pink gems to the top right of the card. Add a message outline sticker.